That doesn't happen in the end but Yeah, I like any couple that has good chances. well, thank you for the up-date. perhaps you could inform evryone else that supported ships that "didn't happen in the end" of the finale of the series. I'm sorry I was just trying to say that you could keep things like a dislike for a couple to yourself, or if you dislike them so much you could put it on your profile. But they do end up rather happy in the epilogue in the 7th book. holy crap i love this favs!!!! awww so cute*favs*ok but who is alissa? oh, and I forgot to mention that Hedwig and Crookshanks look reeeeeeeeealy cute!!! this really is a fabby pic, All the people look fantastic and really cute.....yay!!! Oh my god! They're all so cute!!! Wow this is really cool! YAY! Oh this is really cool. This is going into me favoritez! *gasps* ^O^ OMG OMG OMG OMG!! *claps hands* (does that when I love something) xD Thomas-chan! I LOVE THIS!! And Ginny looks amasing Thomas-chan! U did really good on here even tho you said you werent gonna!! xD I love this picture so much!! 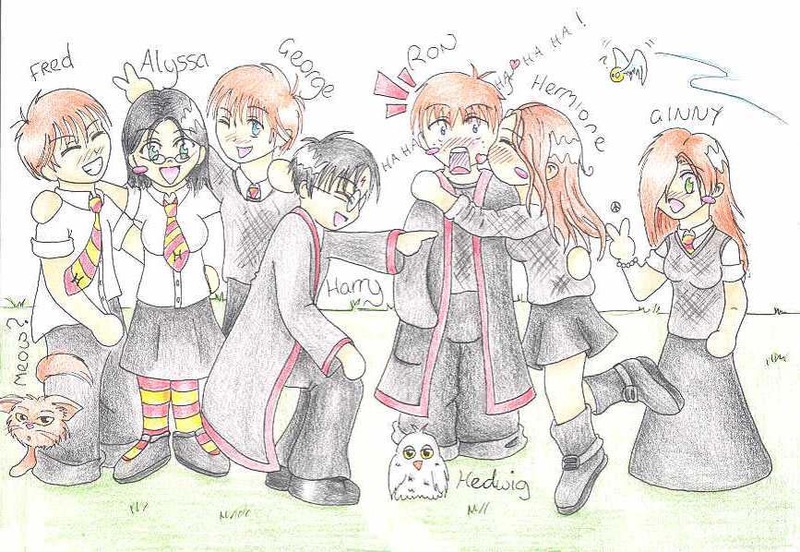 And with Crookshank and Hedwig and the Golden Snitch added is awesome xD Totally amasing!! I love the expression on Ron's face as Hermione is kissing him and that Harry is laughing at them!! Hahaha, Their all so cute! Lookie at ronnie-kins! So cute!